Your own Fully Comprehensive insurance policy. Instant cover from £1.62 a day. We notice you’re on a mobile. To save you some time just add your email address and postcode below, we will then send a quote and information on all our policies to your email address to read at your leisure. We promise you won’t be added to any database or receive any other marketing material from us. Learn to drive in the family or a friend’s car without putting their No Claims Bonus at risk. 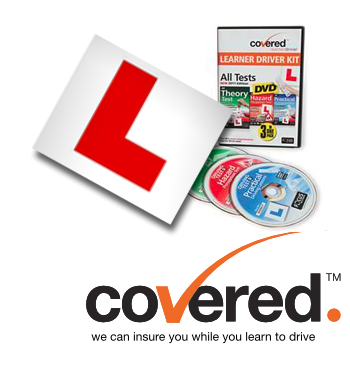 Covered delivers insurance solutions for learner drivers. Our insurance policies are entirely separate from the car owner's motor policy. They provide fully comprehensive insurance cover for the learner should they have an accident while they are learning to drive. Our insurance policy is designed for learner drivers who drive daily, or almost every day. You’re insured to drive at any time the insured car and a supervisor are available. (If you’re only driving a couple of days a week take a look at our New On Demand policy it could save you money). Six policy options 14 days to 5 months. No postcode, age loadings or hidden charges. Simple, Clear Pricing. A Covered Learner Driver policy clearly benefits the car owner by protecting the main policy. It also helps the learner; Driving and Vehicle Standards Agency research shows that learners who have a combination of professional instruction and private practice obtain better results on the driving test. On average, those who pass have had 47 hours of professional instruction and 20 hours of private practice. With a Covered Leaner Driver policy a learner driver can have many hours driving practice at a low daily cost, practicing with someone they know and feel relaxed with, safe in the knowledge they have fully comprehensive insurance in place should they be involved in an accident. A Covered Learner Driver policy can help to lower the total price of learning to drive by over £900, this can be achieved when additional lesson costs along with additional insurance premiums are taken into consideration. **Vehicle must be under £20,000 in value and insurance group 29 or lower, the insurance group of the car will be checked in the application process. Take a look at Covered On Demand. If your not going to drive everyday it could save you money. Built for Learners who are not driving everyday. You can avoid paying for days you're not driving. Use your phone or PC to turn your policy on or off. No Black Box or App to download. Up to 14 extra policy days FOR FREE.